There are just four cars with AWD for less than $25,000 on the market: the Subaru Impreza, Mitsubishi Lancer, Toyota Matrix and Suzuki SX4. Interestingly, they’re all Japanese. We threw them all in the ring together. We brought these rivals together on a particularly wet December 15th. Raining? Try pouring. Instead of the cold and snow that we were expecting, our eight test drivers (Marie-Claude Fallu, Sylvain Gaudette, Geneviève Mercier, Danny Cormier, Frédéric Chapleau, Raymond Morand, myself and my colleague from The Car Guide, Sylvain Raymond) were seriously considering whether they should put on lifejackets or even build an ark. Obviously, we would have liked to be able to pit only hatchbacks against one another, but what can you do – only the Lancer sedan, and not the Lancer Sportback – features AWD. In addition, since the Impreza is only just arriving at dealerships, we had to settle for a four-door. It’s a sign of the times that three of our four rivals were equipped with a continuously variable transmission (CVT). The only one with an automatic gearbox was the Matrix (four speeds). All of them had a four-cylinder engine producing between 148 and 168 horses (see our specifications), but only the Impreza abandoned the rack and pinion in favour of power steering. The sticker prices of the versions tested varied ranged from $22,995 to $24,835. 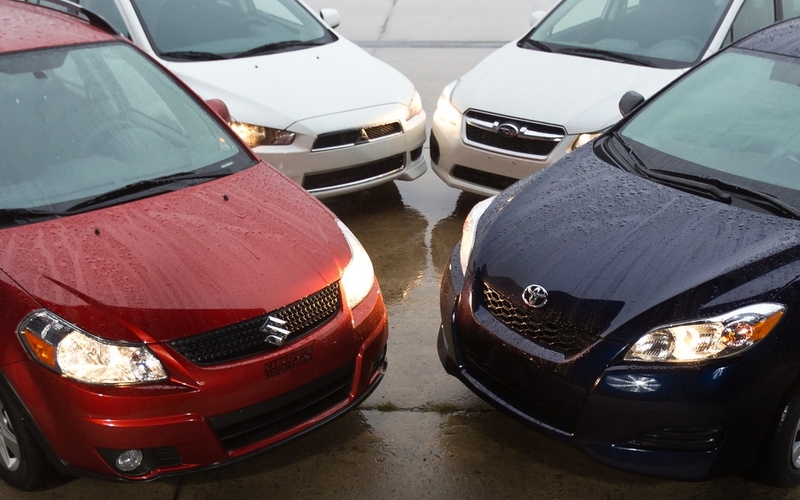 The most expensive was also the “old-timer” of the bunch, the SX4. Surprisingly, the other oldie, the Matrix, was the second-most expensive – and the only one without heated seats. What else? Oh, of course: AWD. From the Subaru’s full-time AWD, to Toyota’s On-Demand to Mitsubishi’s and Suzuki’s three modes (including a Lock mode), they could not be more different from one another. Our drivers braved the rain to test the four competitors, on the road but also on the good ole’ skid pad at the Icar Centre. Suzuki SX4: We like its driving position, but nothing else. The fact that the SX4 is the only one in the group without a telescopic steering wheel wasn’t a problem. On the contrary, everyone sang the praises of the raised seat – it’s true that the ground clearance is at least 2 cm more than the others. Although it’s been around for six years now, Raymond’s comment that it has a lovely shape and Frédéric’s contention that it’s a nice little car are testament to the fact that the SX4 still looks good. And then...bam! The compliments end and the insults begin. First, the soundproofing: Sylvain R. found it deficient, and Fred commented that “you hear the gravel flying in the fenders.” Some found the controls easy to master, like Sylvain G., who said “everything is where it should be.” On the other hand, Raymond, among others, needed a little time to get used to things. As for cargo space, the SX4 doesn’t take advantage of its hatch. Sure, it offers more than all the others once the bench is folded down, but when it’s up, the space is more limited than with other models. “You’re not going to get much in there,” says Geneviève. Now for the drivetrain: Marie-Claude estimates that “it seems to be the least powerful of the lot.” (Editor’s note: that is true, by two horses.) “The CVT? Gross!,” scowled Sylvain R. Geneviève added, “the sound of the engine is harsh.” The fuel consumption for our trip on the highway was 10.9/100 km, almost a litre more than the Subaru Impreza. The AWD, despite improvements to its 3-Mode, wasn’t enough to convert anyone. Danny found it slow to react, instable and jerky, while Frédéric said that it was complete garbage on the skid pad. Finally, the Geneviève likened the suspension to a see-saw. The word “disappointment” came up often when discussing the SX4. “It’s fine if you always drive at the same speed,” said Frédéric. All of our drivers agreed that the SX4 is too expensive. The Toyota Matrix did not finish last, even though our drivers called it boring (Danny), generic (Sylvain G.), monotonous to drive (Marie-Claude), and “meh” (Geneviève). On almost all points, the Matrix is about average and that’s what saves it from last place, despite its higher ticket price and its equipment that’s less generous than with other cars. Imagine, the Matrix doesn’t even have an on-board computer, which means that we couldn’t even compare its fuel consumption to the others (so we simply scored it average). Overall, Sylvain G finds the drivetrain is smooth and relatively quiet, and that it works well in spite of the only four-speed automatic gearbox in the group. As outmoded as it may be, Sylvain R. considered it the most efficient of them all. However, several drivers said that they got confused with the dashboard-mounted stick shift. Harshly, Frédéric went so far as to say that a stick shift doesn’t belong on the dash. Neither Sylvain was particularly impressed by the Matrix’s dashboard. The first called it outdated and too high, while the second, while adding that it’s functional, called it ugly and invasive. On the other hand, the AWD stirred up fervour, and not for the right reasons. Danny qualified the On-Demand device as “bad and, unfortunately, always active,” while Sylvain G. confirmed that it’s inefficient and slow to react. No one expected much from the Lancer, which is a recurring problem for Mitsubishi. But it’s hot on the heels of the Subaru Impreza, and way ahead of the SX4 and Matrix. Another twelve or so points and maybe the Lancer would have come out on top. The test drivers were most surprised by the Lancer’s handling and performances. Frédéric said, “that’s some engine in there!” And with its 168 horses, the Lancer is the most powerful of the group. For Geneviève, the Lancer won this round. For Sylvain G., the suspension, acceleration, power and smoothness of the engine are good. Even the transmission is decent, for a CVT. “The engine is both very smooth and powerful, and the steering is precise,” added Danny. “It’s sporty, it moves and it’s a lot of fun,” says Raymond. Where the Lancer loses points is in its passenger compartment. Critiques ranged from bleak (Sylvain G), dull and plastic (Sylvain R.), to nauseating (Marie-Claude). It also loses ground because of its gluttony: the trade-off for greater power was a 12.1 L/100 km fuel consumption, which is a third more than the Impreza’s 9.0 L/100 km (on equal trips). It didn’t take long at all for all eight of our test drivers, including Raymond, who originally had a soft spot for the Matrix, to fall under the spell of the Subaru Impreza. Where the Lancer disappointed, the Impreza’s passenger compartment hit the nail right on the head. Sylvain R. found it hip and modern, Danny praised its central console, and Sylvain G. lauded its interior that he found nice without being gaudy and its beautiful finish. The main this is that the AWD was excellent. Frédéric beamed “finally, a real AWD!” Danny remarked that it was “very stable”, and Sylvain R. called it “the most efficient.” Sylvain G. mentioned that “the system is very competent, always on duty and predictable. It seems like the car is on rails.” It’s a widely-known fact that despite its full-time AWD, the Impreza was the most economical on fuel on the highway, with an impressive 9L/100 km. Thanks to our test drivers Marie-Claude Fallu, Sylvain Gaudette, Geneviève Mercier, Danny Cormier, Frédéric Chapleau, Raymond Morand, Sylvain Raymond and Nadine Filion. And thanks to Canadian Black Book for the resale values.